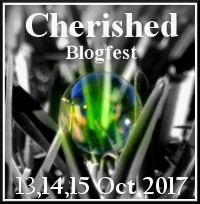 Are you ready for Cherished Blogfest? Hi CB Fans! I’m Kate. I’ve been asking myself, “What object do I cherish the most? What object has the most memories attached? What is my most useful object no, irreplaceable object? back into time so she didn’t have to decide, you, know, in THE pinch. Anywho, I’ve found my cherished object! um-hmmm, like i own a money. you guys are easy! photograph, and ‘splain your cherished object. Read what others say about theirs. (aka co-host) and visit participant’s pages! and me busy, reading until the wee hours! Don’t say I didn’t warn you; you’ve had enough time. In seventeen days tell the world about your favorite object and the story behind it. enter your blog post entry into the Linky List. July 29th, 30th or 31st 2016! #CBF16 (for you twits on twitter) or #cherishedblogfest! This entry was posted in Cherished Blogfest, Testimonial and tagged #CBF16, #cherishedblogfest on July 12, 2016 by dkatiepowellart. It would be hard to decide what to take in a fire. I have too many irreplaceable objects for just one trip. Mine has to be small. Cats in hands…. I don’t know why my “about” showed up but I can’t take it off….